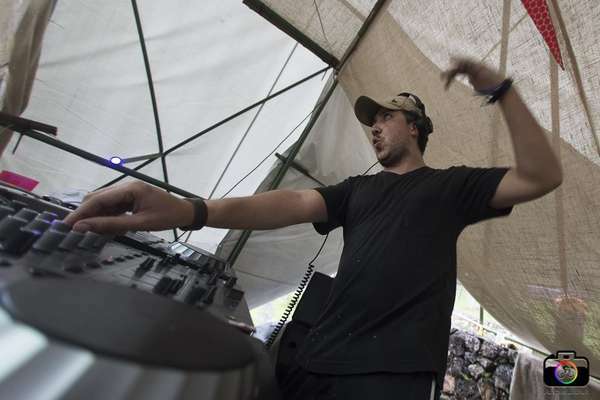 Brazilian born Ronei Leite has been producing psy-trance for the last 10 years, releasing on top labels such as Iono, Profound and Digital Nature. He’s just released his debut album on Blue Tunes records which is no mean feat and has well and truly cemented his highly respected position firmly in the scene. 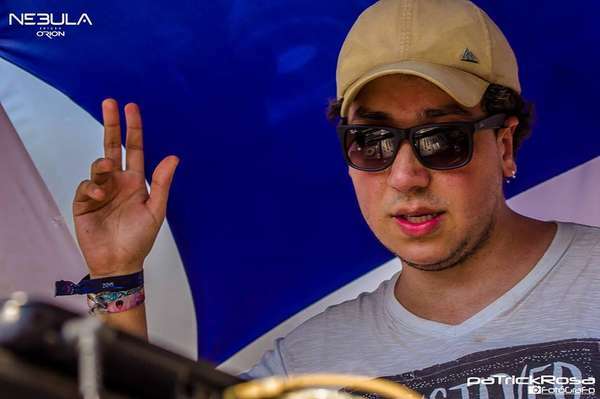 Ahead of his release Deep Connection on Reincarnations Recordings – I wanted to catch up with Ronei and find out more about the person behind the artist! Ronei – tell us where it all began. What led you to the psy-trance scene, how did you discover the music? During most of my childhood I remember hearing a lot of Rock and Roll music, my brothers listened to it at home. I believe that in the 90's, after my sister bought some CDs of techno and trance, I started to listen as young as 13 years old and this is when I began to like trance music and I started looking for new tunes myself. I was still in high school and a friend gave me a Psytrance CD, at the time I was already listening to some trance artists like Armin van Buuren, Ferry Corsten, Paul van Dyk and others. This CD included tracks from artists like Infected Mushrrom and Skazi and it got me more interested in the genre. I did some research and found more good psytrance artists like Ibojima, Protoculture and others. Do you remember your first psy-trance party? My friends took me to a small party called Carpe Diem! That was when I had my first experience at a psytrance festival, and yeah, I really liked it. I remember the music in the morning, the melodies and different sounds which I had never heard before – it was all new to me. 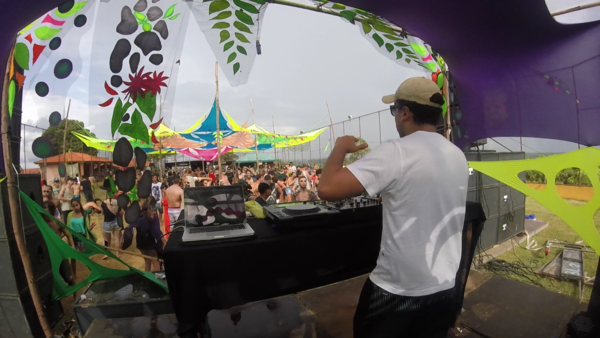 One thing I knew for sure, I had to go back and I had to experience another psytrance festival soon! This was back in 2007 and I’m still going and loving it to this day! What is it about the psy-trance scene that attracts you and keeps you in it? Definitely the energy at the festivals and the amazing people involved in the scene. Here in Brazil we have a lot of parties all year, so I think this helps inspiring us producers. We can take the energy and be creative by making something new which we can play at our next gigs! 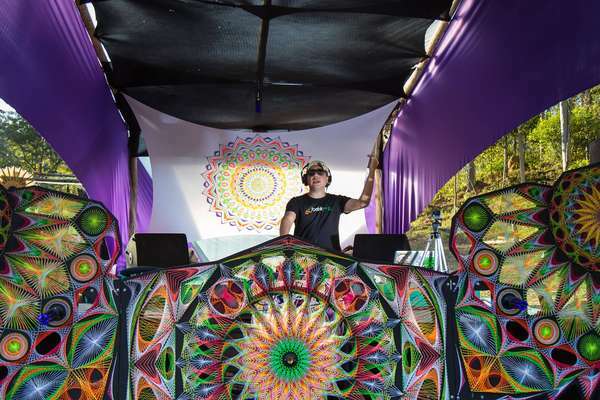 We’re currently seeing a big increase of festivals around the world like Boom and Ozora! When did you first start producing? What set up did you first have? Hahaha – well, I started producing 10 years ago and during that time I’ve used a lot of different set-ups. I started out with a PC (windows) running Cubase Sx3 and a small audio interface and headphones which I used instead of monitors. When you sit down to write a track – what’s the process for you? I read that you “believe in passing the message of transcendence and mental evolution through (your) creations”. Can you expand on this? I think when you listen to any type of trance music, you receive a message from inside the music putting your mind into a state of trance. Yeah of course, we currently have some different trance styles that are actually not that trancey, but in my opinion - that’s the most important element – the trance. Trance is what I feel we need to bring to the people on the dance floor! It’s not just jumping up and down or fooling around in ecstasy, but it’s about your mind actually connecting to the music, the people, nature and to technology. You need to feel the energy inside your mind. In my opinion it’s a process of evolution inside your head. When gigging, do you DJ or play live? How do you prepare for a gig and what goes through your mind when you’re on stage? I think the most important thing when you play is to feel and see the energy of the dance floor. That’s why I don’t make any type of pre-selected order of my tracks. I don’t have any idea about what might be happening before I arrive at the party. Every party is different and at each party you have a different feeling. A lot depends on what time you play and who played before you – this definitely influences a lot. My setup is a Traktor Scratch Pro with Native Instruments Z1 Midi controller which I use to mix my tracks together like a DJ. This just came about quite recently, for most of my career I have played with Ableton Live. Over the years I have tested a lot of different set-ups; like in 2014 I played live with Multi Track Stems using a Midi Controller (Akai APC40) along with Ableton. It’s very interesting to experiment with different live setups and see how people react to your performance. The most important thing in my opinion is to get the dance floor! You live in Sao Paulo, Brazil - but have travelled all over with your gigs. What differences and similarities have you noticed amongst the scene on your travels? 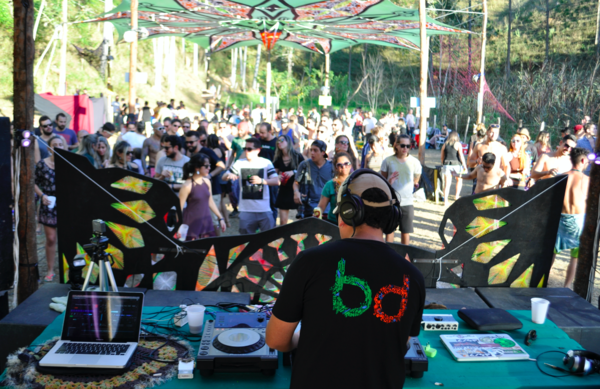 Currently most of my gigs are in my country (Brazil), we have a lot of great parties and good party organisers. I gain a lot of experience from my gigs, and my travels allow me to see and learn about different cultures which is something I love – I’m very grateful to have these opportunities. Brazil is beautiful, it’s rich in nature - it has beautiful rivers and beaches. Every year I see more and more people getting into psytrance music, and this really motivates me to get in the studio and do my best to create new music for the dance floors. Next summer I hope to play some gigs in Europe, and maybe Japan. Let’s see how things go. The world is big and there are so many different places to go to and spread my music! Music is Universal, Psytrance is Life! You’re also a well-respected sound designer and have released many awesome quality sound banks. How did this come about? & tell us about how you go about creating these sound palettes? Yeah that’s my second job. I started so I could produce better music, but in 2010 I stopped making music for a year and used that time to create my first sound bank. I started out with disco DSP – Discovery Pro, and since I’ve continued creating presets and samples. The last time I counted my sounds, I think I had more than 17,000 presets in 50 packs! Today I’m working with a lot of distributors like Dance Midi Samples, Producer Loops, Beatport Sounds and many more. What and who inspires you in your creations & in life generally? My first inspiration came from classic trance artists like Armin van Buuren, Paul van Dyk and other greats of the scene. When it comes to full on morning psytrance I listen a lot to artists like Astrix, Protoculture, Vibe Tribe, System Nipel, Electro Sun and Phanatic. In progressive psytrance I love artists like Zen Mechanics, Vertical Mode, Symbolic, Audiotec and many more. How do you think your friends would describe you as a person? Probably as a workaholic hehe! For most of my life I am inside a studio, whether it’s tutoring students or making new tracks. I also like to go to the pub with my friends and talk, have a few beers, like most people really. During the week I normally can be found at lectures which are Monday - Friday, so basically when I play and go to a festival it’s like a holiday. Well I don’t buy that much music really, my friends tend to send me their creations for feedback. I do have some tracks just to listen and relax to and for inspiration, but I don’t play them in my sets as I don’t DJ and in my live sets I only play my own tracks and remixes. I love listening to artists such as Ace Ventura, Zen Mechanics, Vertical Mode, Symbolic, Audiotec and many others. What hobbies and interests do you have other than music? I like going to my friends’ houses and having barbecues and beers. I also love to go for a drive so I often do this to relax - it’s good for me. I live a pretty simple life - I enjoy time with my family at the beach – just relaxing. You’ve just released your debut album ‘Magnetic Field’ on Blue Tunes. Tell us about the album – was there a concept, what experience can listeners expect from it? This album is very important to me, because I have changed my setup in the studio to make it. I felt the way my productions were evolving I needed an acoustically treated room, so in 2015 I decided to sell all my hardware synthesizers and invest in high quality acoustic materials and upgrade my monitors. So basically 85% of my studio setup consists of plugins these days, and I really feel I can create everything I need with my current setup to work on a new masterpiece. 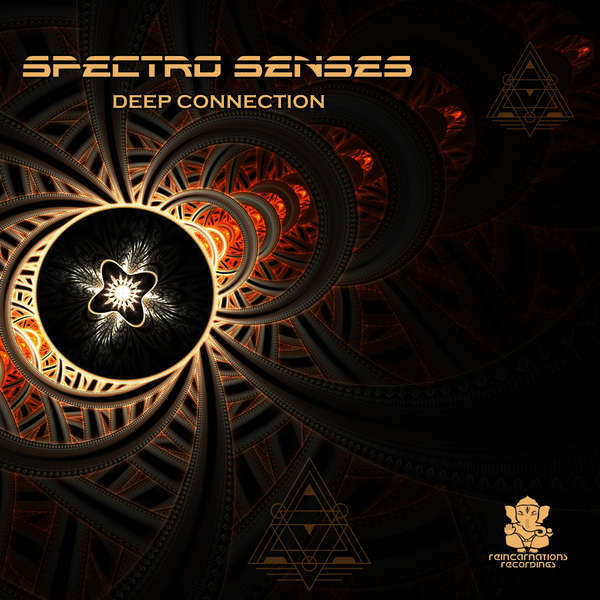 You have a powerful track due for release on January 8th on Reincarnations Recordings: Spectro Senses - ‘Deep Connection’. How did this track come about? This track travels deeper and has a softer kick & bass. Sometimes I just like to take one special line and work with it - keep it going and make the trance flow. This is more of a progressive trance track and I think it will be an awesome release. I would like to say thank you to Steve Morley (System E) and (Jessica) Cathar who are supporting this track and have signed it to their label. I hope we will be working a lot together. I’m really looking forward to this release – it will rock! What else is upcoming for Spectro Senses in the future? I’m very excited with some of the new remixes I have done for some great artists such as Lyktum and One Function. I’m also excited with the tracks on my album, especially the track with Mind Spin and Sonic Sense. I tested these tracks on the dance floor and people seem to love them, so I think they take my live set to another level! I’d like to say to all my fans, when I play at a party whether there are 10k people or 100 people - I play with the same love. I love to see the smiley faces in the crowd on the dance floor and love feeling the energy! My fans can rest assured I will do my best to give them the absolute best experience of trance music through my live set! I really want them to enjoy it! Yeah thanks! Always is a pleasure! Cheers from Brazil! Deep Connection on Reincarnations Recordings is available from Beatport on January 8th. Images courtesy of Ronei Leite. Not to be reproduced without permission.